As previously anticipated, Google Docs has a new homepage that's better suited for managing files, not just editable documents. There's a sidebar that shows a small thumbnail and some useful information about the selected file. Google added new filters for images and videos, for public and private files, but dropped the advanced search form, which was more difficult to use. The drawback is that there are many search features that are no longer available in the interface and you need to use operators to get them back. For some reason, Google Docs has a new name for folders: they're now called collections. "Collections are designed to combine the best features of labels and folders. A file can live in multiple collections, just like with Gmail labels. Collections can also be stored hierarchically, just like folders on your desktop. 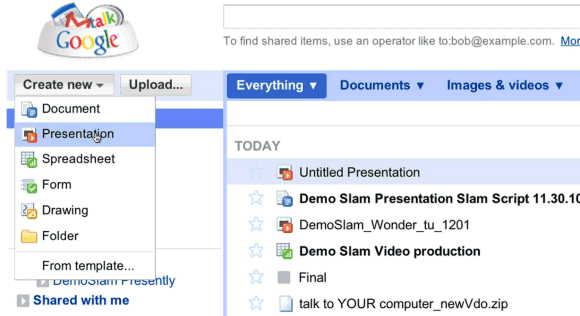 And of course, collections can be shared, just like you can share docs," explains Google. Technically speaking, none of these features is new, but it's much easier to add a file to multiple folders collections. Unfortunately, Google's new terminology will probably confuse users and many people won't realize that clicking "Organize" lets you add a file to a collection. Google also dropped checkboxes, so now it's much more difficult to select multiple files: you need to use Shift for contiguous selections or Control for scattered files (Cmd if you're using a Mac). Another new feature is priority sorting, which orders files based on importance. For example, a starred document that has been last updated 5 hours ago is likely to rank higher than a more recent document that hasn't been starred. Google says that it's like Gmail's Priority Inbox, but there's an important difference: Gmail always sorts conversations by date. Overall, the new Google Docs homepage is a mixed bag. Google tries to morph Google Docs into an online storage service, while moving away from the initial goal of the service: editing documents online. Suddenly Google Docs is no longer an appropriate name for the service, 1 GB of free storage is not enough, the APIs are no longer useful because they're limited to editable documents and Google's applications seem limited because they can't handle all the files that can be uploaded. The new homepage can't address these issues, but it manages to make the interface more complicated: now it's a lot easier to open a file when you want to select it and to select the file when you want to open it. Tip: If you don't like the new interface, there's an option at the top of the page that lets you temporarily switch to the old version. You should bookmark the URL: https://docs.google.com/?ui=1, since there's no option to permanently switch to the old UI. Google started to filter search suggestions that include terms associated with copyright infringement like "torrent", "bittorrent", "rapidshare", "megaupload". It's a slippery slope and Google's suggestions will be less useful since they'll no longer include many popular searches. Last month, Google explained that this is one of the changes intended to address copyright infringement. "We will prevent terms that are closely associated with piracy from appearing in Autocomplete. While it's hard to know for sure when search terms are being used to find infringing content, we'll do our best to prevent Autocomplete from displaying the terms most frequently used for that purpose." 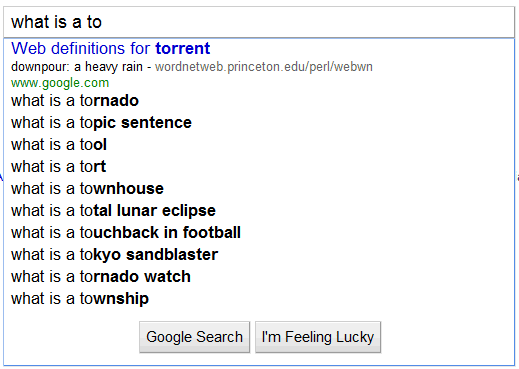 Blacklisting keywords like "torrent" is a terrible way to prevent copyright infringement since users can always type queries without Google's help. The main consequence is that Google will appear to be broken and users will no longer trust the suggestions because they're censored. Last year, Google started to become politically correct by removing the suggestions for queries like [why are muslim]. There will always be complaints about the suggestions, but starting to arbitrarily blacklist keywords opens a can of worms and makes it easy to remove other controversial suggestions. As Mashable says, "this is a subtle form of censorship, and at first glance it seems trivial. However, even though the censorship is slight, it still indicates Google's willingness to change its search protocols to satisfy the needs of a certain business group, in this case members of the entertainment industry." Google doesn't blacklist "pirate bay", "isohunt", "mediafire", "cracks", "serial numbers", "keygen" and there's a simple trick to bypass the existing filters: start your queries using the blacklisted keywords (for example: [torrent ubuntu 10.10]). Greg Sterling spotted image ads in Gmail and this seems to be a controversial Gmail experiment. A Google spokesperson said that Google "recently started experimenting with image ads on messages with heavy image content." Greg confirmed that the image ads aren't displayed next text-only messages and they sometimes appear next to HTML messages that include a lot of images, especially newsletters. 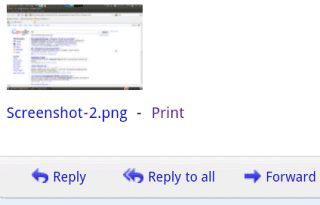 Gmail's image ads are contextually targeted, but it's unlikely that users will tolerate them well. After all, one of Gmail's selling points was that it only used relevant text ads. Here's Google's answer from 2005 to the question "What makes Gmail different? ": "There are other differences in the way Gmail provides access to your email. For example, Gmail automatically groups an email and the replies to it as a conversation. That means you always see a message in its proper context. And there are no pop-ups or banner ads in Gmail, just relevant text ads and links to related pages". 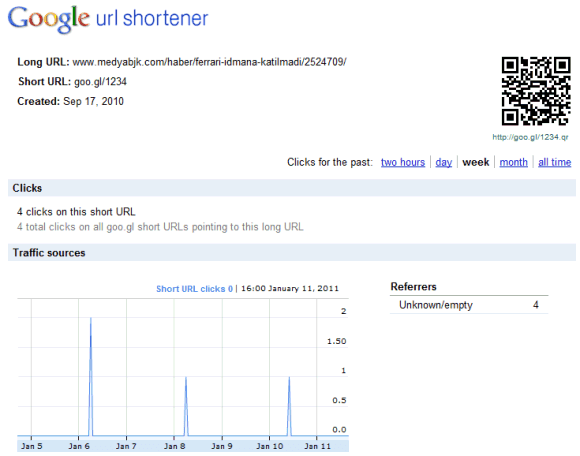 Google's explanation continues: "[Gmail ads] are small and unobtrusive. They don't fill half your screen and we don't make you read them just to get to your inbox. Ads are never inserted into the body text of either incoming or outgoing Gmail messages and you won't see any pop-ups or untargeted banner ads in Gmail." It's interesting to see that a Gmail page about privacy explains that "showing relevant advertising offers more value to users than displaying random pop-ups or untargeted banner ads". The key words are "random" and "untargeted". Last year, Google announced that it started to index SVG files, but the results were only returned by the web search engine. 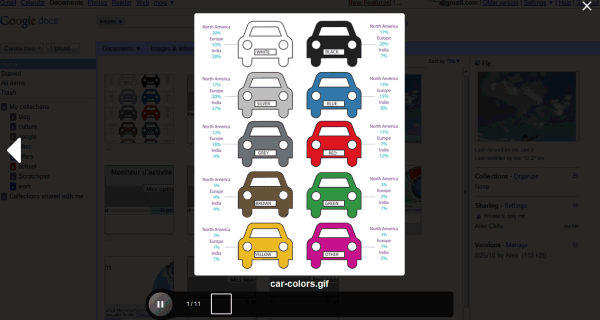 "SVG is an open, XML-based format for vector graphics with support for interactive elements. We're big fans of open standards, and our mission is to organize the world's information, so indexing SVG is a natural step. We index SVG content whether it is in a standalone file or embedded directly in HTML," explained Google at that time. Now you can find SVG files in Google Image Search by restricting the results to this filetype in the advanced search page or by using the filetype operator. 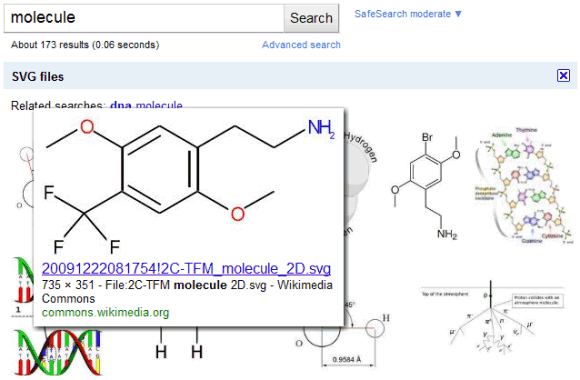 Here's an example: [molecule filetype:svg]. If you restrict the results to Wikipedia, Google returns 57,300 SVG files. Most browsers can render SVG markup, but there are at least two important exceptions: Internet Explorer (IE9 will add support for SVG) and Android's built-in browser. If you use Google Chrome, you can enable a new Gmail feature that shows desktop notifications for new messages. Go to "Settings", and enable chat notifications and mail notifications to see a small bubble when you get a new message. If you get a lot of messages, it's a good idea to only enable notifications for important messages. The nice thing is that the notifications are displayed even when you're visiting a different site or the Chrome window is minimized. Gmail's blog mentions an important use case: "you've probably missed an important chat message because you weren't looking at your Gmail window when it came in". Unfortunately, you'll no longer see the notifications if you close Gmail or Google Chrome, so this isn't a perfect replacement for Gmail Notifier. This issue could be solved by background web apps, a new Chrome feature that allows installed web apps to run in the background. Right now, desktop notifications are only available in Google Chrome, but this feature has been implemented in WebKit and there's a W3C draft for web notifications. 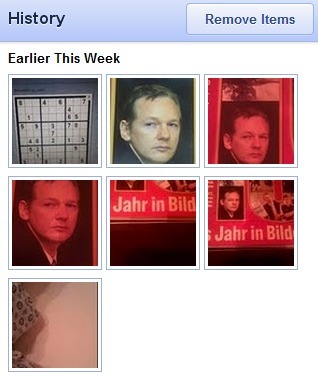 Google Calendar has a similar feature as part of the "Gentle reminders" experiment. YouTube has a new option that lets you group comments and their replies. It's called "sort by thread" and it's only available if you click "see all" next to the number of comments. The option is useful if you read a reply to a comment, but you can't find the initial comment. Here's an example. Sterling, a reader who noticed this feature, says that "the comments on YouTube are a mess, so confusing, but it looks like YouTube is testing threaded comments on the site. I wish this feature was in the watchpage, but it only shows up in the All comments page." Favicons could show some useful information, not just a static image. If you'd like to see the number of unread messages next to Gmail's red envelope, enable "Unread message icon" in Gmail Labs. The feature only works in Chrome and Firefox, but it's not very reliable. "When you're visiting sites other than Gmail, it's easy to find out how many unread messages are in your inbox by glancing at the title of your Gmail tab or window. However, if you have a ton of tabs open, or if you use Chrome's Pin Tab feature that hides everything except the tab's icon, it can be tricky to figure out without switching tabs," mentions Gmail's blog. The counter is supposed to show the number of unread messages from the inbox, but it doesn't always work properly. If you'd like even more features, Lifehacker suggests to use Minimalist Gmail, a Chrome extension that not only adds an unread counter to Gmail's favicons, but it also lets you customize the navigation bar and remove extraneous features like the "invite a friend" box or the cluttered footer. Google Voice has a lot of features that help you manage multiple phone numbers more like your email accounts. The main problem is that you need a new phone number to use most of the advanced features and this is not convenient. 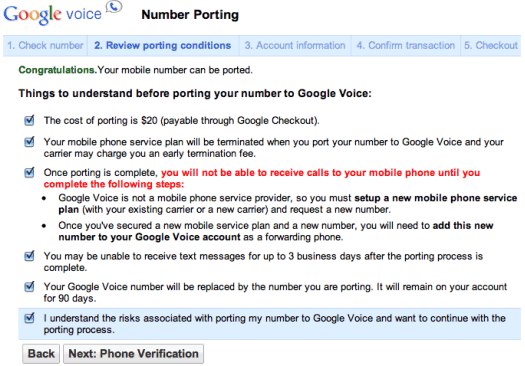 Now you can port an existing mobile phone number to Google Voice for a small fee: $20. The process is rather complicated and may incur additional charges, but it's important to keep in mind that Google is not a wireless carrier (at least not yet) and you'll still have to get a non-Google phone number. Number porting is a feature in which your existing mobile number will become your Google Voice number and you can take advantage of the full set of the Google Voice features, like one number to ring all of your phones, online voicemail, and more. Number Porting also costs a one-time fee of $20, payable via Google Checkout. Note that you will still need carrier service (Sprint, T-Mobile, Cricket, etc.) to receive calls on your mobile phone. At the moment, you can make free calls in the US and Canada if you use Gmail Chat, but it's likely that this feature will also be available in Google Voice's mobile apps for Android and iPhone. Google has enabled Cloud Print in Chrome's Dev Channel builds for Windows, but the only option available was to print a test page. 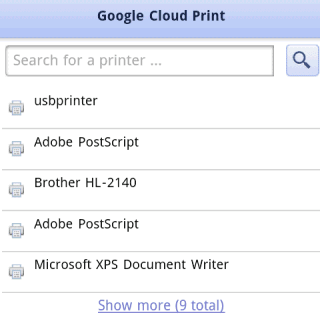 Now you can use Google Cloud Print from Gmail's mobile web app for Android and iPhone. The integration lets you print attachments without having to use a full-fledged computer. Since there's no printer with native support for Google Cloud Print, you still need a computer running Google Chrome. Cloud Print is enabled by default in Chrome Dev Channel and it can be manually enabled in the other builds by typing about:flags in the address bar, clicking "Enable" next to "Cloud Print Proxy" and restarting the browser. To be able to use it, you first need to go to Options >> Under the hood >> Google Cloud Print and log in with a Google account. Update: According to Google, this feature is also available in Google Docs. "This feature will be rolling out for English speaking users in the US and will work on most phones that support HTML5, such as devices running Android 2.1+ and iOS 3+." Google made a small change to the navigation bar used for its non-search services: the link to Google Reader was moved to the "more" drop-down, while the link to Picasa Web Albums was brought back to the main bar. At some point, both links were included in the main bar. Google's Brian Rose said that the Picasa Web team is working on "some fun stuff" and we'll hopefully see some important changes in the near future. Meanwhile, Google Reader's team posted on Twitter that "the Reader link at the top of Gmail (and other sites) was accidentally removed. It's coming back soon, we promise." It's still surprising to see that Google's navigation bar is not customizable and you can't add your favorite Google services. Google tested a customizable bar back in 2006, but this feature was quickly abandoned. Update: A few days later, the link to Google Reader is back. Eric Schmidt announced today that Larry Page will become Google's CEO. Sergey Brin's new title will be Co-Founder and he will work on strategic projects, while Eric Schmidt will be the Executive Chairman. "I will focus wherever I can add the greatest value: externally, on the deals, partnerships, customers and broader business relationships, government outreach and technology thought leadership that are increasingly important given Google's global reach; and internally as an advisor to Larry and Sergey," explains Eric Schmidt, who became Google's CEO in August 2001. It's interesting to notice that today's announcement sends Google back in time. 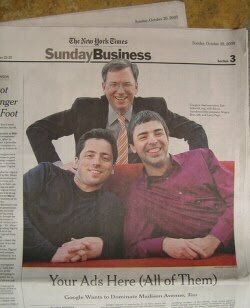 10 years ago, Larry Page was Google's CEO and Eric Schmidt was the chairman. Now "day-to-day adult supervision [is] no longer needed." Google used to group the options from the search sidebar so you can quickly find the filters related to location, visited pages and the different ways to present search results. All these groups have been merged and Google only kept the group that lets you restrict the results to recent web pages. Google also removed the "related searches" view which showed a list of related searches at the top of the page and allowed you to compare the results for different searches. "Based on your search and the Google property you've selected, you'll see a customized list of filtering tools. We'll automatically show you the tools that seem most relevant to your search, so you won't always see all of these tools," explains Google. 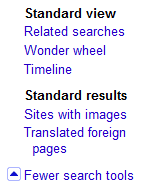 To display all the filters, click "more search tools". Google's search engine is already fast, but what if you could save more time? Let's say that you've typed a query and pressed Enter, but the results aren't great. How to quickly delete your query and type something else? Press Esc and start typing the new query. Another option is to click on the small "x" icon from the search box. If you want to add some new keywords to your query, there's no need to scroll to the top of the page and find the search box. Just type the words you want to add. Google is smart enough to insert a space since this key is used for scrolling. 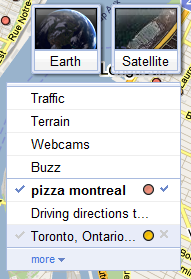 After more than three months of testing, the new Google Maps navigation controls have replaced the classic tabs. 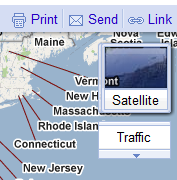 By default, Google shows a small preview of the satellite imagery and a link to the traffic layer, but you'll get more options if you mouse over "satellite" or "traffic". 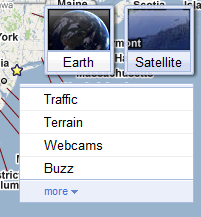 Google lists the layers that are available (terrain, webcams, the confusingly named Buzz, videos, Wikipedia, bicycling, real estate, transit, 45 degree imagery, labels), including a list of previous searches and driving directions. "When we launched Google Maps, we had one layer -- the map. Since then, we've added more than ten different ways to explore the world around you, including photos, transit and traffic information, as well as satellite and terrain views. We've now updated the design so that you can more easily see and switch between the various viewing options that are available," explains Google. I find the new interface more confusing, but I admit that it will better accommodate the new layers that will be released. Until now, if you wanted to switch to the satellite mode, you clicked the "satellite" button and that was it. Now Google shows a lot more options when you mouse over the button and you might even forget what you wanted to do. There are so many Labs features in Gmail that's difficult to find one of them. There's always Ctrl+F to the rescue, but you shouldn't have to use a browser feature for this. To solve this problem, Gmail added a search box that performs some simple text matching and it's not another Labs feature, so anyone can use it. 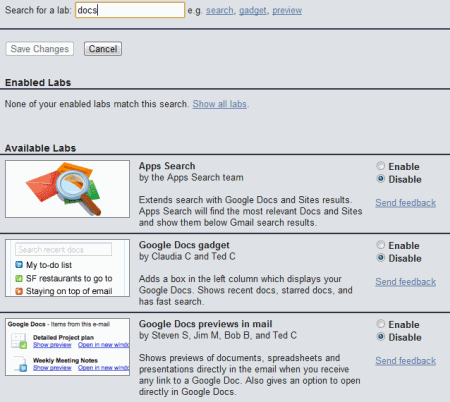 Start typing docs, chat, labels and you'll see a list of Labs experiments that match your keywords. My favorite feature is that you can now link to a Gmail Labs experiment by adding /keywords to the URL: http://mail.google.com/mail/#settings/labs/apps search. A recent Chromium build updated the message used for the "clear browsing data" section. 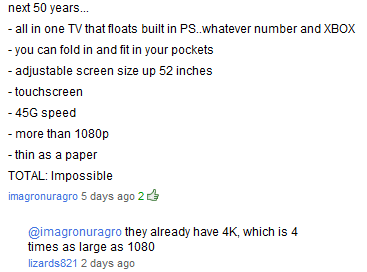 The most impressive option lets you "obliterate the following items from the beginning of time". It's less boring than "clear browsing data from this period: everything", but users may need to use a dictionary and to get a sense of humor. In other news, the tabbed settings page is now the default option in Chromium and this feature will probably be enabled in Chrome 10. The new settings page comes with a search box that lets you quickly find an option (this feature would be much more useful in Firefox, Opera or Internet Explorer) and a default page zoom option. 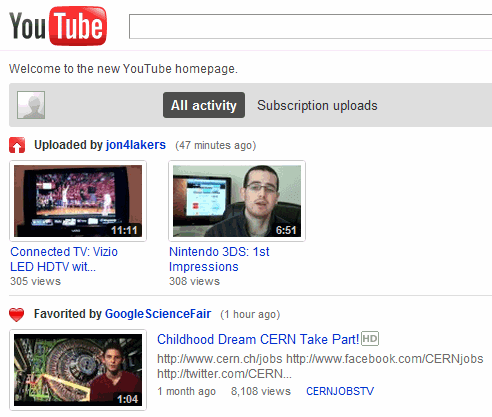 If you don't like the combined view, click on "subscription uploads" at the top of the page to only see the latest videos from your favorite channels. Unfortunately, the homepage is no longer customizable, so you can't hide the sections you don't use. 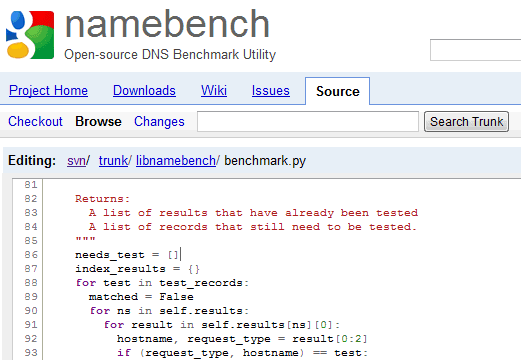 Google's service for hosting open-source projects added a new feature that lets you edit your files from a browser. It might seem like a minor addition, but it could be the first step towards a full-fledged online IDE. "Perhaps you were browsing the code online from your Cr-48, or perhaps you just didn't have Subversion or Mercurial handy. Today the Google Project Hosting team is announcing a new feature for you: the ability to edit your source code files directly in the browser, in our online editor powered by CodeMirror. Just look for the 'edit file' link on files in the online source browser: As you edit, you can preview the diff of your changes so you know exactly what you are committing," explains Google. The nice thing is that you can edit a file even if you're not a member of a project. After making the changes, submit the new version of the file as a patch, along with a description. If your patch is approved, your changes improve an open-source project. When you develop a product and use liberal licensing terms, there's always the risk that someone else will use your code to create a poor product. Maybe it will include a lot of unnecessary features, it will be slow and have a lot of bugs or it will never use the latest version of your software. Android's goal was to be a common baseline that enables innovation in the mobile space. Convincing other companies to use Android wasn't easy and that's one of the biggest Google accomplishments. Not many people believed in Android's success three years ago and its adoption rate is still surprising. Convincing companies to update their Android-based firmware faster is much easier. If users only buy Android phones that have the latest version of the operating system and constantly request phone manufacturers and carriers to update the software, then they'll work harder to improve their products. Google has recently released some information about the current distribution of the Android versions and the good news is that 87.4% of the Android phones use Android 2.x, up from about 55% in July. 51.8% of the phones use Froyo, a version released 7 months ago. In only one month (August 2010), Froyo's share grew from 5.5% to more than 28%, after Motorola and HTC updated phones like Droid, Droid Incredible, Evo 4G, and Desire. ZDNet says that "almost 13% of Android users are still running versions of the mobile OS that are several generations old and these users will never see Android 2.1", but this percentage is constantly decreasing. Even if they're using Android 1.6, that's still a much better operating system than the one from a feature phone and it still lets them use many apps from the Android Market. A slower update rate is a small price to pay for creating an ecosystem of heterogeneous devices that run the same operating system which is not perfect, but it's "good enough". Knol's homepage says a lot about the current state of the project. 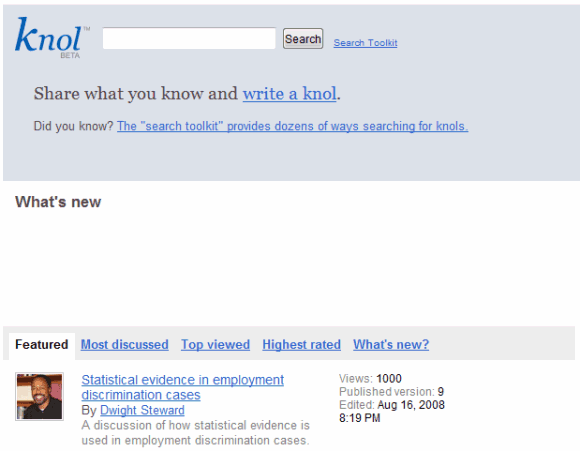 There's a big empty section called "what's new", a single featured knol that has 1,000 views, while the "most discussed" section doesn't include any knol and the search feature no longer works properly. 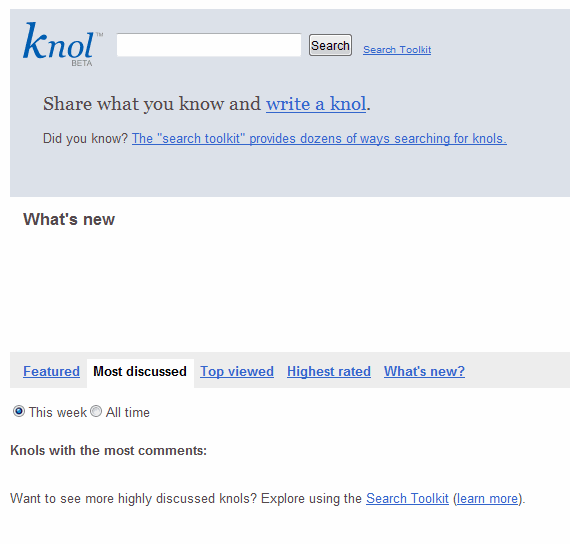 Knol has been last updated in December 2009 and it's obvious that the service has been abandoned. Somebody needs to close Knol before it's too late. If you want to find a list of abandoned Google products, check the copyright notice at the bottom of their homepage and see if it's been updated. Friend Connect, Google Desktop and Knol still show an old message: "©2009 Google". Update (one day later): Knol is up and running again, but for how long? Google updated the group of video search results sometimes intermingled with regular results, but only for queries bands and music artists. "People often come to Google to find music videos, and this week we improved our results so now when you're searching for your favorite band or album, you'll find popular clips organized in a new way. For example, search for [michael jackson] and you'll find some of the King of Pop's most famous videos, including clear text indicating the length of the video, the album and the year it was published. The feature scans the entire web for video content and algorithmically ranks the best sources for each song. Rather than return repetitive links, we group results for the same song together, making it easier to scan and choose the song you're looking for." 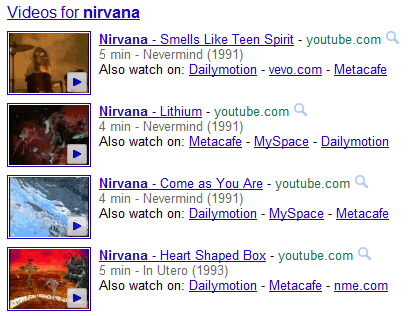 The results aren't always the best music videos and Google should provide options to sort them by year, album, genre. Another issue is that, even though Google shows results from different video sites, the main link usually sends you to YouTube and that's not fair. Why build a local search app for iPhone when the Maps app already lets you find businesses and local attractions? Apple's Maps app doesn't use all the information that's available about businesses, doesn't show photos, reviews and other details. That's one of the reasons why Google decided to build an iPhone app called Google Places. "We realize the importance of finding places you'll love while you're out and about, no matter what mobile device you use. And Places with Hotpot not only helps you find places near where you are, it gives you the best places to go for you by personalizing your search results," explains Google. 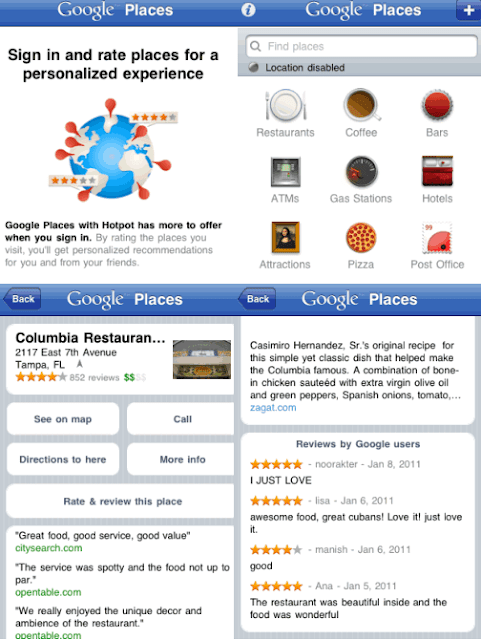 The application integrates with Google Hotpot and uses your ratings and your friends' ratings to recommend other places. Google Places encourages users to rate businesses and to post reviews in order to get better search results and that's an interesting proposition. What's missing from the app is a list of business you've previously rated and the Hotpot feed that's now available on Google Maps. Geo services are one of the key Google assets and it's very likely that Google will use them to create a stealth social network. Google Maps is probably the best mapping service and one of the most popular local search engines, so the social layer will have an important user base. Unlike Google Buzz, Hotpot doesn't have privacy issues yet and it doesn't feel like a different app because it's properly integrated with Google Maps. Google Places for iOS can be installed from the Apple App Store and it's only available in English. Until Google releases a desktop version of Google Goggles, you can see your previous visual queries at http://www.google.com/goggles/history even when you don't have your phone with you. Click on one of the images and you'll see the results, similar images and links to related web pages. It's surprising to see that this service is not yet integrated with Google Web History and it's not part of Google Image Search. Gmail added a feature that used to be available in the Apps Search experiment from Gmail Labs: a spell checker for your queries. For example, if you search for [anounced], Gmail will show a message above the results: "did you mean announced". Gmail doesn't have a special query spell checker, so it gets the suggestions from Google Search. Gmail's search feature is a lot less sophisticated than Google's Web search engine, which replaces some of your words with synonyms or similar terms and sorts the results by relevance. Google could use the importance flags and other signals to find results that are likely to be important, the search engine could index attachments and it could become a module from a more comprehensive search engine that shows results from Gmail, Google Calendar, Google Docs, Google Reader, Google Maps, Google Buzz, Google Contacts and much more. Google Translate's app for Android added a feature that has previously announced by Google: conversation mode. The new option is experimental and it only works for English and Spanish, so it's more like an early preview. Conversation mode is a fancy name for making it easy to have a conversation in two different languages. "In conversation mode, simply press the microphone for your language and start speaking. Google Translate will translate your speech and read the translation out loud. Your conversation partner can then respond in their language, and you'll hear the translation spoken back to you. Because this technology is still in alpha, factors like regional accents, background noise or rapid speech may make it difficult to understand what you're saying," explains Google.